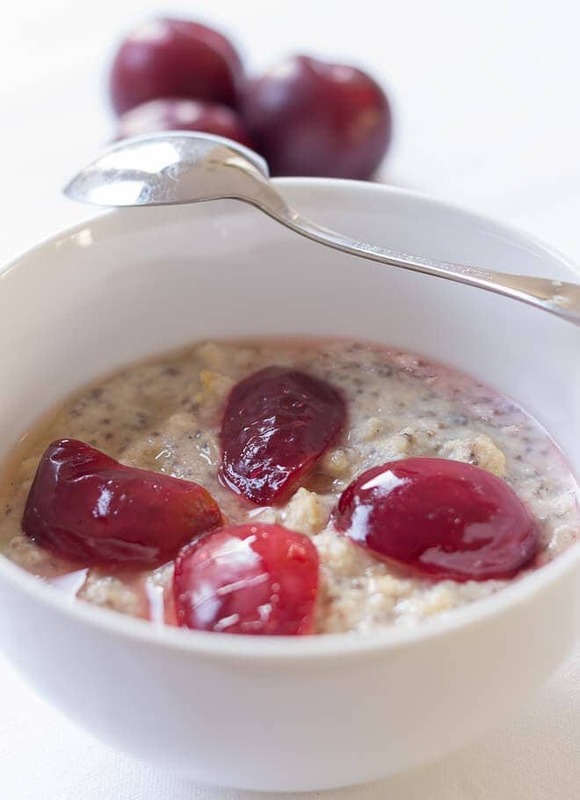 Spiced plum millet porridge tastes deliciously thick and creamy, and it’s gluten free too! The spice and plum adding a healthy natural sweetness. If you haven’t tried millet porridge before you’ll love this! 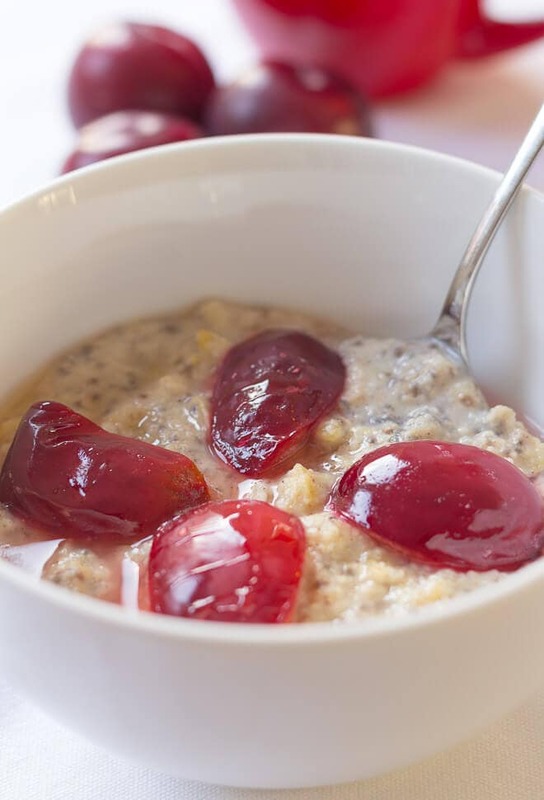 Wake up those taste buds with this superb alternative porridge breakfast. Here’s the second recipe, a spiced plum millet porridge, in my week of different porridge breakfasts for you to try to give 2015 a great healthy start. Whilst on our honeymoon in Kenya in September 2013 I discovered that Millet Porridge was available for breakfast in most of the places we stayed in. Being someone who likes to try anything, especially porridge related, I instantly headed to the porridge breakfast location each day. However, I just could not get used to the taste of that dull grey looking concoction which tasted like soil! 😮 That was unusual for me, as someone who likes just about anything. 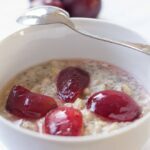 Where To Buy Millet Porridge For This Spiced Plum Millet Porridge Recipe? Undefeated and rolling in to 2014 I discovered I could buy millet flakes in Holland and Barrett and thus set out to find a way I could add it to my breakfast porridge repertoire. This gluten free spiced plum millet porridge is deliciously thick and creamy and gluten free too. Place the millet flakes into a small saucepan with the chia seeds, milk, vanilla essence and cinnamon powder. Bring to the boil and then simmer, stirring continuously until the milk has been absorbed by the oats and a desired consistency is achieved. Place the millet flakes into a microwaveable dish with the chia seeds, milk, vanilla essence and cinnamon powder. Microwave on full power for 2 minutes, stir and then microwave for one more minute. (Microwave times may vary so watch the porridge does not boil over). Remove the cooked porridge to a serving bowl. Stir in the flaked almonds and flax seeds. Place the quartered plum, star anise and water either in a small saucepan or a microwaveable dish. If using cooking on a stove method, sauté the plum over a low heat until it has softened. If using a microwave, cover the dish and microwave on high for about 1 minute until it has softened. Remove the plum quarters to the porridge bowl. Drizzle the runny honey over. The millet flakes and chia seeds can be soaked overnight in the milk. If you find the porridge is not creamy enough then stir in 1 – 2 tbsp. fat free yogurt of choice. Feel free to add a little more honey here to this spiced plum millet porrisge if you find the taste a little too sharp for your liking, or stevia, but I find that the spiced plum is just enough to sweeten it up for me. What do you think? What toppings do you like on your oatmeal / porridge? Your inventive and exotic porridge bowls are making me rethink my oats/peanutbutter/cinnamon/chocolate ones! Such a wonderful array of flavors and so enticing for a food texture lover!